Terry Crowley came to RAF Brize Norton in December 1962 and was billeted in The Talbot. He found 'Thatched Cottage' in Church Street and while it was dilapidated, Terry fell in love with and asked his wife Wendy to come and see it. They both came in the bitter snows of early 1963 and had to walk from Brize Norton because the roads were blocked but Wendy liked it too. 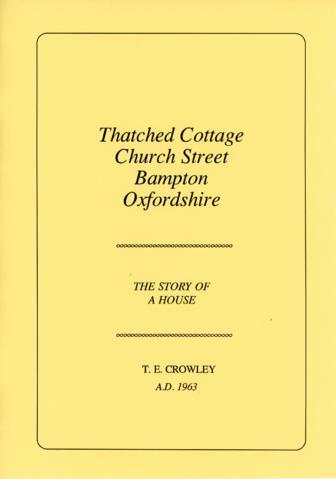 Terry wrote a book about the history of the house, which is one of Bampton's really old houses, with cruck beams, thatch, and many other delightful characteristics, and their gradual restoration of this dear thatched cottage. This is Terry's book and it makes a really good read for anyone interested in architecture and the history of old buildings.